Bolton held on to beat Wolves to claim their first win of the season and move up seven places, to 16th in the table. 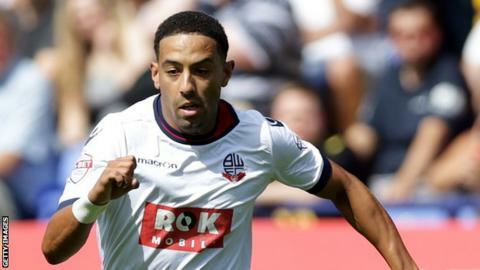 Liam Feeney met a long ball in the box to fire Bolton ahead, having earlier gone close with a double chance. Zach Clough made it 2-0 from the spot after Ethan Ebanks-Landell brought Wellington Silva down in the area. Prince-Desir Gouano fouled Adam Le Fondre to allow Benik Afobe to pull one back from the spot, while Ben Amos did well to deny Le Fondre late on. The victory was Bolton's first in 12 games in all competitions, dating back to 6 April, and a first triumph at home since overcoming Millwall 2-0 at the Macron Stadium more than six months ago. Defeat leaves Wolves one point and one place ahead of Bolton. Wolves' on-loan Cardiff City striker Adam Le Fondre - who had a spell with Bolton last season - scored both the Trotters' goals in their last home win, which came against Millwall in March. Emiliano Martinez, starting ahead of goalkeeper Carl Ikeme, who kept a clean sheet on his Nigeria debut against Tanzania last week, was called upon early on by Feeney, with the winger then putting his follow-up effort wide. Feeney eventually beat on-loan Arsenal goalkeeper Martinez to open his goalscoring account for 2015-16, punishing Wolves' defence for failing to deal with a long ball over the top. Ebanks-Landell went close to a quick response, while Afobe, Le Fondre and James Henry threatened, before Clough doubled the Trotters' advantage in first-half injury time following Ebanks-Landell's challenge to stop Wellington's fine run into the box. Jed Wallace was off target for the visitors before Le Fondre went down under Prince's challenge, allowing Afobe to hit back from the spot. And Wolves continued to press in search of a leveller, with Dave Edwards going close and Le Fondre and Matt Doherty both calling Amos into action. At the other end, Martinez twice kept Bolton out late on, foiling Emile Heskey before denying Mark Davies from close range, while Gary Madine wasted a good chance from 10 yards for the hosts. "I am more relived than anything else. I've not had a run like that in my career either playing or managing. "It's been a very frustrating time. But I thought the way we were playing, we could turn things around. "I felt we deserved to win. Their penalty was soft and changed the psychology of the game for a while." "We will play worse than that and win games. We had a lot of chances. "I felt after a rocky first 15 minutes, we played well and dominated the majority of the rest of the first half. Then we had a real go second half trying to get back into the match. "We showed some good spirit and played some good football. But we have to iron out one or two areas and lose some naivety in some situations where we have given away too many easy goals and sides haven't earned them." Match ends, Bolton Wanderers 2, Wolverhampton Wanderers 1. Second Half ends, Bolton Wanderers 2, Wolverhampton Wanderers 1. Attempt missed. Gary Madine (Bolton Wanderers) left footed shot from the left side of the box misses to the left following a fast break. Attempt missed. Sheyi Ojo (Wolverhampton Wanderers) left footed shot from the left side of the box misses to the right. Assisted by Benik Afobe. Attempt saved. Matt Doherty (Wolverhampton Wanderers) header from the centre of the box is saved in the bottom right corner. Assisted by Sheyi Ojo with a cross. Corner, Wolverhampton Wanderers. Conceded by Ben Amos. Attempt saved. Adam Le Fondre (Wolverhampton Wanderers) left footed shot from the centre of the box is saved in the centre of the goal. Assisted by Sheyi Ojo with a cross. Attempt saved. Matt Doherty (Wolverhampton Wanderers) header from the left side of the box is saved in the top right corner. Assisted by James Henry with a cross. Attempt saved. Matt Doherty (Wolverhampton Wanderers) header from the centre of the box is saved in the top right corner. Assisted by James Henry with a cross. Corner, Wolverhampton Wanderers. Conceded by Derik. Adam Le Fondre (Wolverhampton Wanderers) wins a free kick on the right wing. Foul by Derik (Bolton Wanderers). Attempt missed. Adam Le Fondre (Wolverhampton Wanderers) right footed shot from the right side of the box is high and wide to the right. Foul by Adam Le Fondre (Wolverhampton Wanderers). Derik (Bolton Wanderers) wins a free kick in the attacking half. Attempt saved. Mark Davies (Bolton Wanderers) right footed shot from the centre of the box is saved in the centre of the goal. Assisted by Gary Madine with a headed pass. Corner, Bolton Wanderers. Conceded by Emiliano Martinez. Attempt saved. Emile Heskey (Bolton Wanderers) left footed shot from the left side of the box is saved in the centre of the goal. Assisted by Mark Davies with a through ball. Attempt missed. Dave Edwards (Wolverhampton Wanderers) right footed shot from outside the box is too high. Assisted by James Henry. Attempt saved. Adam Le Fondre (Wolverhampton Wanderers) right footed shot from outside the box is saved in the top left corner. Assisted by Benik Afobe. Attempt blocked. Gary Madine (Bolton Wanderers) right footed shot from outside the box is blocked. Assisted by Mark Davies. Attempt missed. Gary Madine (Bolton Wanderers) right footed shot from the centre of the box is high and wide to the left. Assisted by Mark Davies. Substitution, Bolton Wanderers. Emile Heskey replaces Zach Clough. Attempt missed. Dave Edwards (Wolverhampton Wanderers) right footed shot from the centre of the box is close, but misses to the left. Assisted by Sheyi Ojo. Ethan Ebanks-Landell (Wolverhampton Wanderers) wins a free kick in the defensive half. Foul by Gary Madine (Bolton Wanderers). Delay in match Matt Doherty (Wolverhampton Wanderers) because of an injury. Matt Doherty (Wolverhampton Wanderers) wins a free kick in the defensive half. Goal! Bolton Wanderers 2, Wolverhampton Wanderers 1. Benik Afobe (Wolverhampton Wanderers) converts the penalty with a right footed shot to the bottom left corner. Penalty Wolverhampton Wanderers. Adam Le Fondre draws a foul in the penalty area. Penalty conceded by Prince (Bolton Wanderers) after a foul in the penalty area. Corner, Bolton Wanderers. Conceded by Ethan Ebanks-Landell. Corner, Bolton Wanderers. Conceded by Matt Doherty. Foul by James Henry (Wolverhampton Wanderers). Wellington (Bolton Wanderers) wins a free kick on the left wing. Wellington (Bolton Wanderers) wins a free kick in the defensive half.